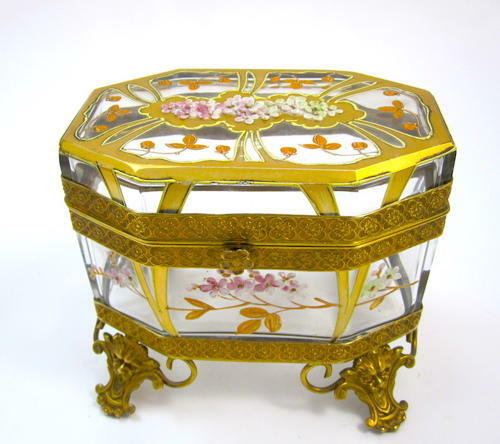 Antique MOSER Art Nouveau Glass Casket with Applied White & Powder Pink Glass Flowers and Decorated with Gold Enamelled Scroll Work and Flowers. Moser's Signature Designs are his Use of Applied Glass Acorns & Flowers; Polychrome Enamelled Oak Leaves, Enamelled Bugs and Applied Grapes Formed from Glass `Jewels'. The Front Panel Decorated with Cherry Blossom which is a Symbol for the Ephemeral Nature of Life. Lovely Dore Bronze Ornate Feet and Dore Bronze Mounts Finely Chiselled with Pansies.